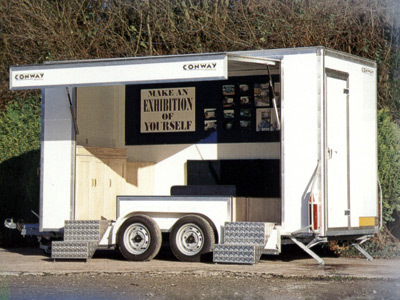 The experience Conway has inherited from 30 years involvement in the manufacturer of trailers, trailer tents, folding campers and mobile accommodation, is now being used to design and manufacture a range of exhibition, display vending and other specialist trailers to meet our customers specific requirements. 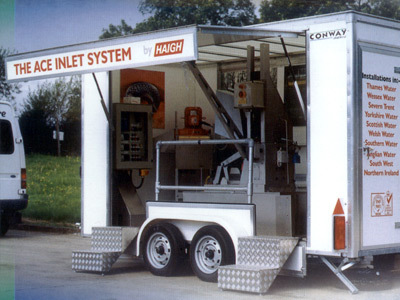 A Conway exhibition unit can be used by all sectors of industry, from private individuals just starting in business to large multinational companies. Not just commerce, but public authorities & utilities, charities and voluntary organisations, all of whom have found an increasing awareness of their products or services by taking them to the public in a stylish Conway trailer. On offer are a range of 6 models, the two smaller units having their wheels on the outside and are ideal for towing with a family car. The larger units have wheels in wheel arched or under the body, giving more width to the trailer. Common to each trailer is the fact that you can be up and running in minutes, generating business from a practical and stylish display facility. The glass fibre exterior can easily be sign written or painted in corporate colours. Within the trailer itself the specifications can be customised to suit individual requirements, whilst more space can be added with the use of platforms, canopies or awnings.